Imelda Avenue was its original name and is taken from the first name of a former First Lady of the Republic. It was appropriate at the time considering it intersected with Marcos Highway, which was being developed as a main thoroughfare to the east and alternate to the older and established corridor of Ortigas Avenue. Imelda Avenue extends from the Cainta Junction where the road continues towards the town center of Cainta as A. Bonifacio Ave., up to Marcos Highway, across which, the road continues towards the Marikina City center as A. Tuazon Ave.
Imelda Avenue is basically a 4-lane, divided road with the division pertaining to the narrow island in the middle of the avenue than separates opposing flows of traffic. At some point in the middle of the avenue, from the Vista Verde subdvision main gate, two 2-lane undivided service roads appear on either side of the highway and continue until Karangalan Village, which has phases on each side of Imelda Avenue. Sometime in the 1990s, the avenue’s name was changed to Francisco Felix Avenue, in honor apparently of a former mayor of Cainta who was the first of a dynasty of three Felixes who became Mayor of the town. The current mayor is a former media personality on his third term and, who seems to be on the way to establishing his own dynasty by already advertising projects and accomplishments of his better half. But that’s politics and definitely another story that we will steer away from. Anyhow, the original name of the avenue was restored sometime ago as most people still referred to it as Imelda rather than Felix. Adding insult to the injury that is congestion along Marcos Highway are the severe jams experienced by motorists and commuters passing through Imelda Avenue. 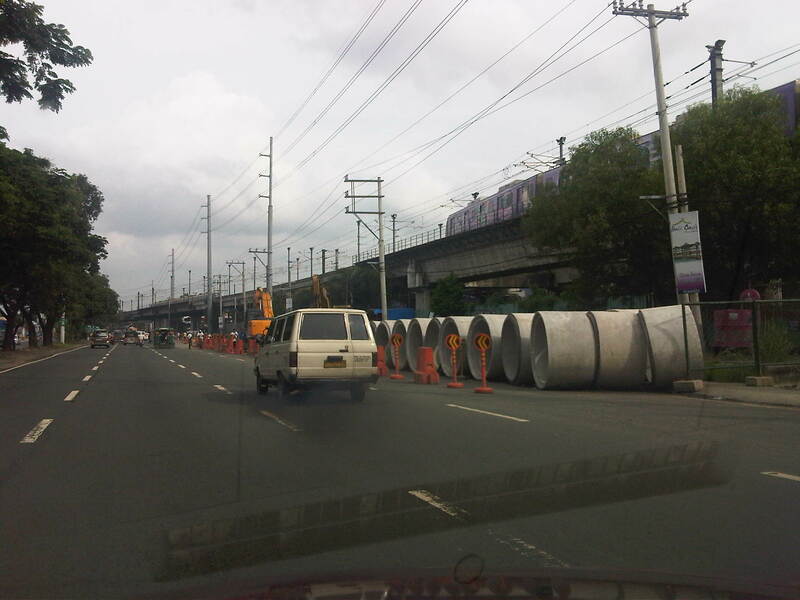 The congestion is primarily attributed to the civil works related to projects of the Manila Water concessionaire whose pipes happen to be located in the middle of the road and not conveniently under one lane of the highway. Manila Water is not to blame as this was something they inherited from the MWSS who laid down the pipes, apparently without the benefit of foresight. 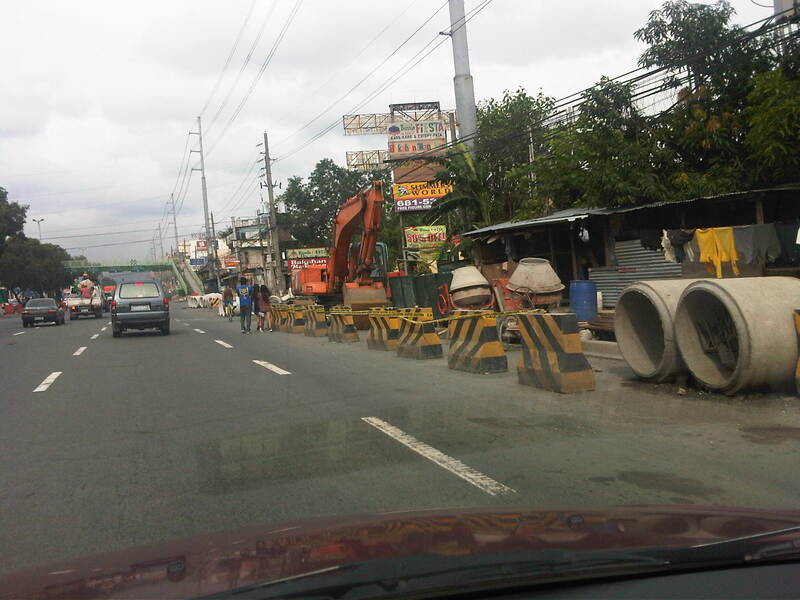 The result of the project is severe congestion as only one lane has been practically available for Cainta-bound traffic. But even without the project, congestion has been an issue due to the continuously increasing volume of through traffic plus the contributions in vehicle generation of the residential areas on either side of Imelda. These generators include the sprawling Vista Verde, Village East and Green Park subdivisions that have relatively high car ownership due to their mainly middle class residents. 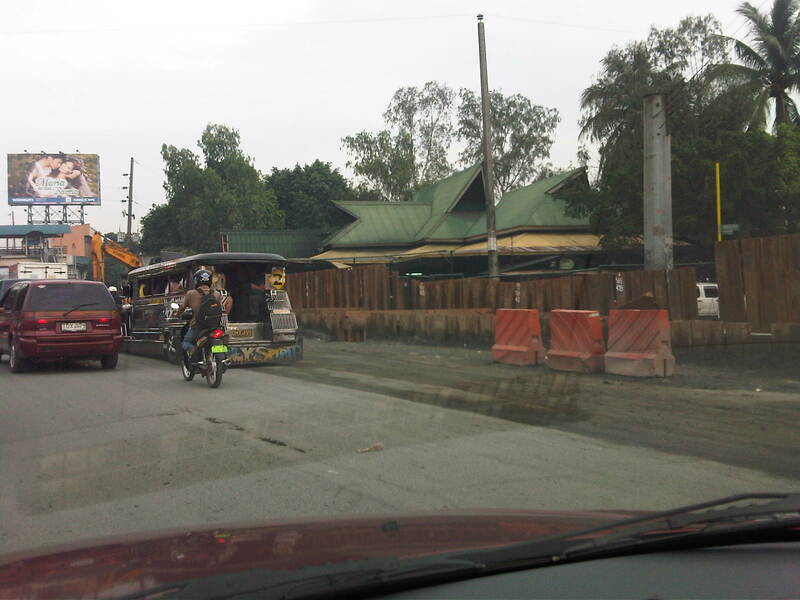 Jeepney operations along the highway where loading and unloading operations are indiscriminate and undisciplined. The two service roads offer minor comfort considering these are usually clogged by on-street parking due to commercial establishments. Tricycles operating along these service roads also contribute to slow traffic if one opts to bypass the sections affected by the water project. The following photos were taken during a weekend trip where I had to pass through Imelda Avenue. Many areas along the highway are flood-prone (much of Imelda was submerged during Ketsana/Ondoy) so this eventuality is partly to blame for what seems to be a slowly progressing project that has already wasted a lot of valuable time and fuel. Hopefully, the project will be completed before the “ber” months arrive when traffic naturally starts to increase due to the anticipation for the Christmas season. 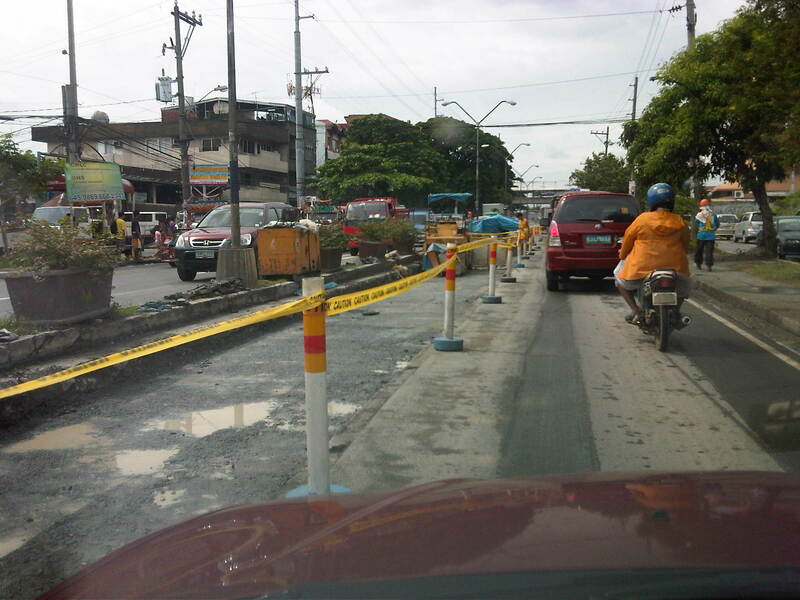 Cordoned section showing only one lane of Imelda Ave southbound available to traffic. Other vehicles brave the west service road on the right. Pavement subgrade prepared for subsequent pouring for concrete at section approaching Vista Verde main gate. The pedestrian overpass downstream serves a national high school along the northbound side of Imelda Avenue and beside the Vista Verde gate. Notice the island on the right occupying space equivalent to 1 lane. 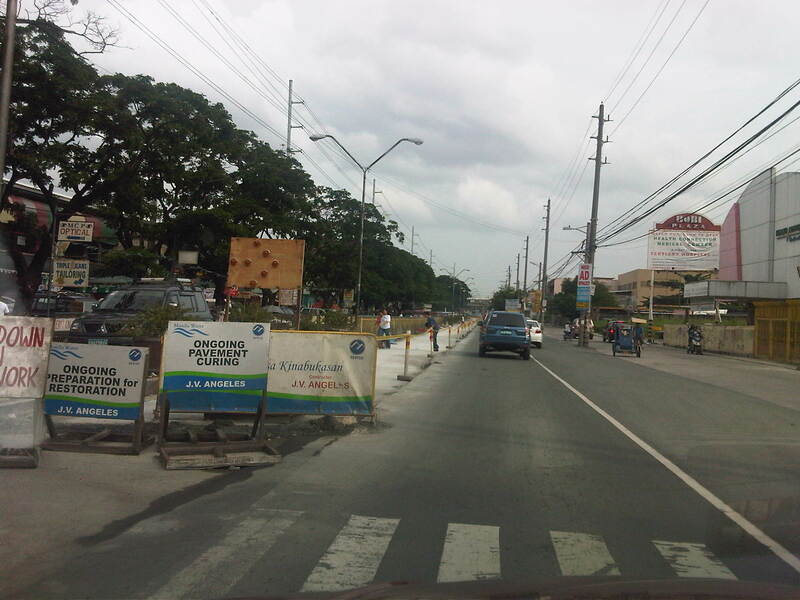 Newly paved lane along Imelda Avenue fronting the Karangalan market. 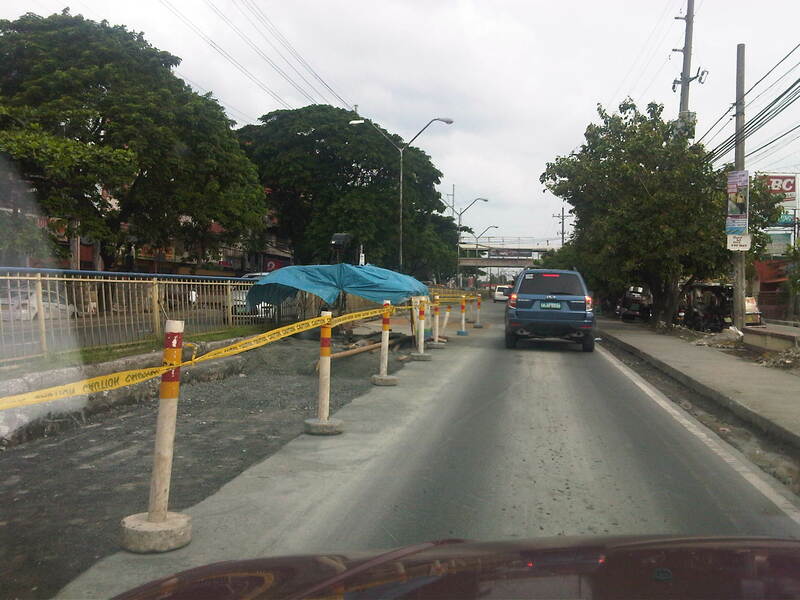 The island separating Imelda from the west service road has been removed along this section to alleviate congestion and permit vehicle maneuvers in the vicinity of the market. Manila Water contractor working on lane past Vista Verde main gate . Notice that there are no service roads along either side of Imelda from this point. 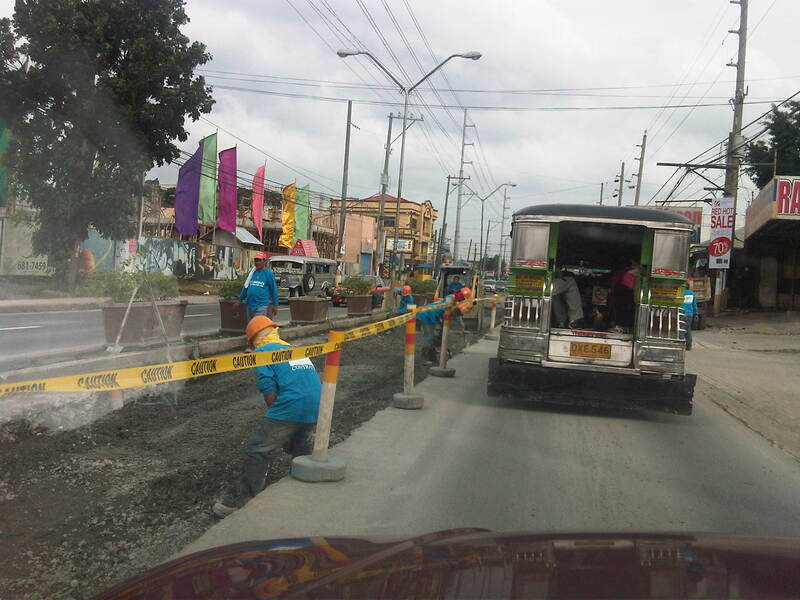 People driving or commuting from the eastern part of Metro Manila and the towns of Rizal Province have been experiencing traffic congestion for quite some time now due to the civil works associated with the improvement of Marcos Highway. The project is part of the Metro Manila Urban Transportation Integration Project (MMURTRIP) that finally pushed through after failed bids that caused significant delay to its implementation. The major components of the project include road widening and pavement rehabilitation, and the improvement of drainage along the highway. The latter component is quite important as the drainage system is supposed to contribute to the alleviation of flooding in areas along the highway. Who knows if the system could have prevented or at least mitigated the floods brought about by Ketsana (Ondoy) in 2009 if the project had been implemented according to its original schedule? The photos below were taken during a regular commute along the highway and shows civil works in various stages of completion. 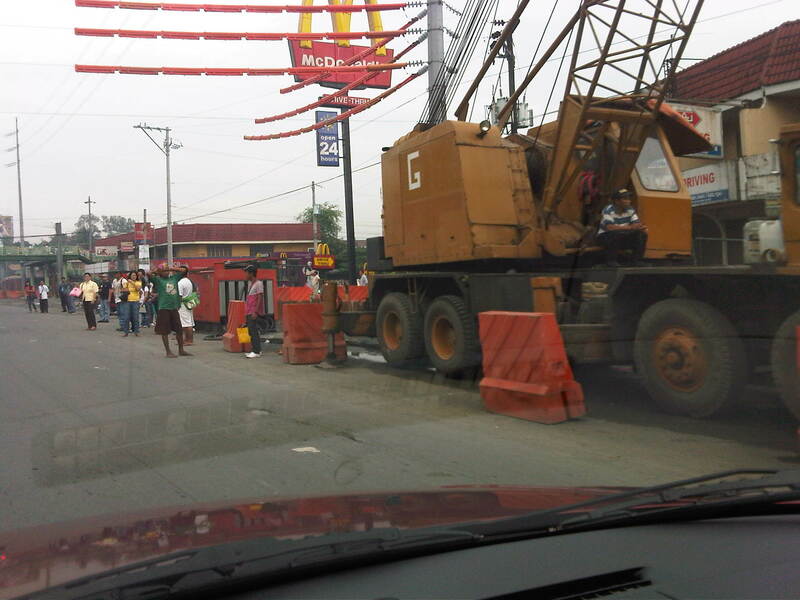 Crane deployed along westbound lane of Marcos Highway – Note the barriers and other equipment that effectively occupy about 2 lanes of the highway and the passengers waiting along the highway. Due perhaps to the magnitude of the project, traffic congestion along many if not most sections of the highway have been inevitable though prolonged. But partly responsible for the congestion is the Manila Water concessionaire that also did their own civil works at the same time as the DPWH project. As such, the capacity of the highway was significantly reduced with the outer lanes affected by the DPWH project and the inner lanes impacted by Manila Water works. We should be hopeful though that once the project is completed, traffic flow will greatly improve and flooding may be alleviated along the highway and its catchment area. Works seems to be continuing although there seems to be less people working on the project these days compared to when the project started. Maybe they are just spread out along the highway? The following photos show examples of progress in the civil works. While it is expected that vehicle flow will be facilitated by the project, it can be said also that this may only encourage more vehicular traffic. As such, perhaps the next project that could be considered for this corridor is the also much-delayed extension of LRT2 towards Masinag. The MMDA issued a memo requiring all Metro Manila buses to paint their license plates at strategic areas of the bus exterior. These include standard sizes for “tags” to be placed on the roof, front, sides and back of the bus that are supposed to clearly show consistency with the license plate. Needless to say, if the license plate and the painted tags do not match, then the bus will be labeled colorum or illegally operating. Tags are also colored according to the general routes of the buses, with the yellow background applicable to buses plying routes along EDSA while an orange background applies to non-EDSA routes like those along Ortigas Ave. and Quezon Ave. The tagging seems to be the latest in a long list of schemes that have been implemented to address the issue of colorum public transportation. While this is generally a matter for the LTFRB, the agency with the mandate to regulate road public transportation, the enforcement aspect is really quite demanding for an agency with few personnel to do this. As such, the LTFRB is usually assisted by other agencies like the MMDA or local government units. Franchise enforcement, however, is generally not the province of the MMDA or LGUs unlike their being deputized by the LTO in enforcing traffic rules and regulations (thus allowing the MMDA and LGUs to issue traffic tickets). The deputized MMDA and LGU enforcers may apprehend public utility vehicle drivers for traffic violations and in an ideal set-up, such violations should be considered when evaluating franchises for renewals. The propensity for violating traffic rules and regulations is a manifestation of poor driving habits and unsafe behavior on the road. Again ideally, such should be taken against operators who have the responsibility for hiring and training their staff. Operators should be held accountable should there be a high incidence of traffic violations and especially when there are incidences of crashes. I am curious as to how the MMDA will be taking advantage of the bus tags in managing not only public transport but overall traffic as well. The tags present an opportunity where data collection may be facilitated and for various purposes. Such include a variation of the license plate surveys that are usually conducted to trace the movement of vehicles and determine whether they are speeding or travelling too slowly. An application of the outcomes of such surveys is the estimation of travel time along particular routes. For enforcement purposes, one can determine the reasonable turnaround time for public transport vehicles and allow for the checking of trip-cutting and the verification of the incidence of multiple plates. With the video cameras located at strategic points along Metro Manila’s major thoroughfares, sophisticated software employing image processing may be able to expedite the process, an example of an intelligent transport systems (ITS) as applied to public transportation. The MMDA could even go further by consolidating travel time/speed data from public transport vehicles in order to derive real-time road network statistics. These could easily be visualized using digital maps that can be made online and shared to motorists and commuters alike to allow for better travel planning around the metropolis. Travel time/speed data have been used by researchers and agencies in other countries to estimate road traffic performance throughout the day and may be employed in modeling traffic in order to predict travel characteristics given typical factors affecting the traffic stream. Private vehicle characteristics are approximated by taxis that operate pretty much like private vehicles given that they do not have fixed routes and are not confined to lanes normally assigned to buses and jeepneys. Katipunan is again the subject of attention thanks to the Sunday newspaper article by Prof. Randy David in his column at the Inquirer. The problem is not really new and I have been familiar with the congestion and its derivatives from the time I first studied in UP Diliman in 1988 and up to now when I continue to pass through the avenue between home and workplace. I was able to dig up a 2003 study on Katipunan conducted by the National Center for Transportation Studies (NCTS) of UP for a consortium chaired by then DENR Secretary Bebet Gozun. The study was the group’s response to the MMDA’s effort to install their U-turn scheme along Katipunan, encouraged at the time by the scheme’s apparent success along Commonwealth and EDSA while not acknowledging the problems experienced along Quezon Avenue. The photos below were taken during the time when the study was being undertaken and are very much the same picture of Katipunan today during the peak periods. “After a thorough evaluation of the traffic problems along Katipunan as well as the solicited and unsolicited solutions from stakeholders, it becomes clear that the answer to the Katipunan traffic question is not the introduction of the U-turn scheme into the system. Indeed, while the U-turn scheme has met with relative success along major thoroughfares including Marcos Highway and Commonwealth Avenue, it has also contributed if not created congestion along Quezon Avenue. The notion that “success in EDSA and Commonwealth means there is no reason why the scheme won’t work in Katipunan” would not hold water in the light of the requirements for effective implementation of U-turns. Simply said, the traffic volume along Katipunan during the peak periods alone will assure that the U-turn scheme will cause more congestion rather than mitigate it. Optimization of traffic signals – coordination of signals need to be implemented particularly for the intersection pairs identified in this report. The Traffic Engineering Center (TEC) must be consulted with respect to the operation of the traffic signals along Katipunan. Restriction of roadside parking – parking restrictions must be strictly enforced and establishments along Katipunan should adhere to the required parking slots corresponding to the traffic they generate. Removal of parts of the islands to improve flow – geometric improvements to ease flow (i.e., increase road capacity) may be explored. Note that this report is not entirely opposed to removal of parts of the islands. However, their outright removal with the trees for the sole purpose of the U-turn scheme is not acceptable to most stakeholders. This must be carefully evaluated. Construction of an internal road between Ateneo and Miriam – the internal road will allow common vehicles to circulate within the campuses thereby eliminating traffic that would otherwise make several entries and exits to the campuses via Katipunan. Open additional gate at Ateneo – the possibility of opening another gate at Ateneo between the existing Gates 2 and 3 must be explored. Encourage carpooling or car-sharing – it is strongly recommended that Ateneo and Miriam consider carpooling or car-sharing schemes. It has been found that traffic along Katipunan is primarily composed of private vehicles will low occupancies bound for the two schools. While the surveys showed high return rates from grade school and high school students, very low returns came from college students. It is these people who account for a majority of the vehicles that clog Katipunan and they should take part in the formulation and implementation of such schemes that would lead to a significant improvement to traffic along Katipunan. The study recommended alternative solutions in lieu of the U-turn scheme for Katipunan Avenue that was at the time being pushed by the MMDA as the solution for traffic congestion in the area. The recommended measures considered different aspects: traffic management per se, geometric improvements or road construction, travel demand management, land use, and other measures. 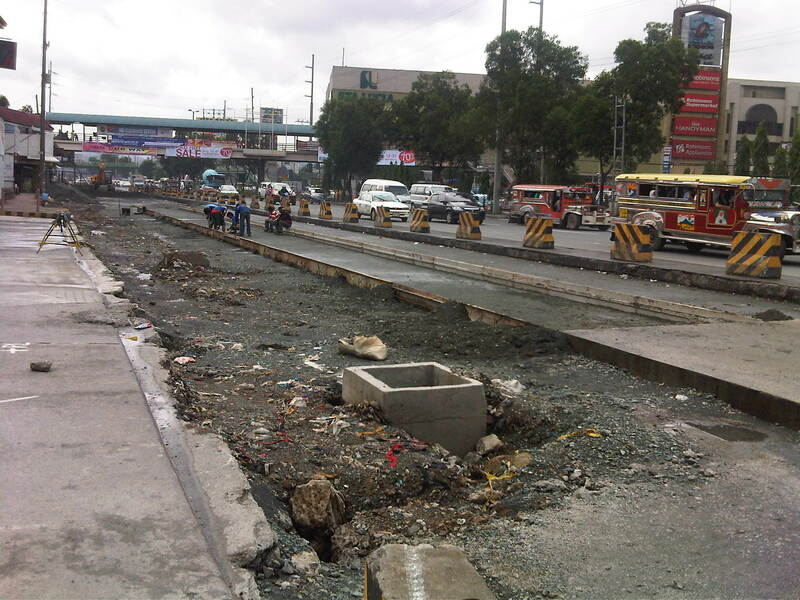 However, it seems that 8 years after there has been practically no change in conditions along Katipunan Avenue. The support and commitments of the different stakeholders (academic institutions, residents, business establishments, professional organizations, government agencies, and concerned citizens) are essential for the successful implementation of the recommendations contained herein. It is only through a strong partnership that sustainable and long-term solutions to the traffic problems in Katipunan Avenue can be achieved. However, it is realized that there should be some sacrifices involved including a dramatic or drastic change in the travel behavior of those mainly responsible for the congestion. The vehicle trip generation of both Ateneo and Miriam are the roots of the problem and their continuing resistance to proposed solutions while not offering any viable countermeasures or proposals will only serve to perpetuate congestion in the area even as the external costs associated with the traffic they generate spread to a larger area. Recent studies at the UP Diliman, which is an open campus, has shown that private vehicle through traffic (i.e., traffic that has nothing to do with UP) has also grown and most of these are Ateneo and Miriam-bound trips. It seems awkward and even confusing to see that 8 years after what was perhaps the last (maybe even the first?) serious look into Katipunan traffic, conditions have only worsened. This is due to additional developments in the area including high density residential projects that also tend to generate a lot of traffic, and commercial establishments that do not provide sufficient parking spaces. But although these contribute to congestion, their vehicle generation pale in comparison to that of the schools in the area. This is perhaps a case where one is able to see the flaws of others and yet refuses to look in the mirror to see for oneself something that needs critical attention. Last Friday, a rally was held just outside the Ateneo De Manila University along Katipunan Avenue to protest the construction of Blue Residences, one of the SM group’s high-rise condominium projects that is located near the corner of Katipunan Ave.-Aurora Blvd. where a mini golf course and a few small shops used to be. The protesters wielded placards stating what could have been applicable to many of the developments now standing along Katipunan and just across from Ateneo and Miriam College. This is not really a new issue the protesters were dealing with but something that, dare I say, has festered for quite some time now. 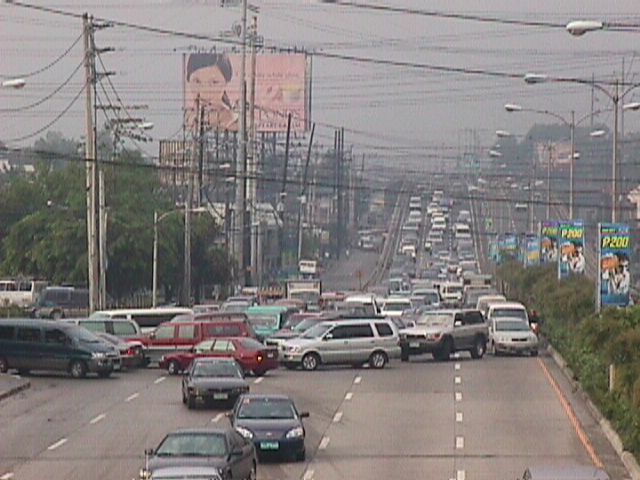 The issue of land use and zoning along Katipunan is a continuing struggle against what the Quezon City government has maintained as its policy for “spot” zoning to accommodate high density residential and commercial development along a stretch of Circumferential Road 5 that used to be predominantly low density with small shops and restaurants lining the west side of the road and separated from the main highway by an island and a two-way service road where local traffic including tricycles flowed. This was the Katipunan I first started to be familiar with in the late 80’s when I entered UP as a freshman. Miriam was still known as Maryknoll at the time and was run nuns prior to it becoming the secular but still Catholic institution that it is today. 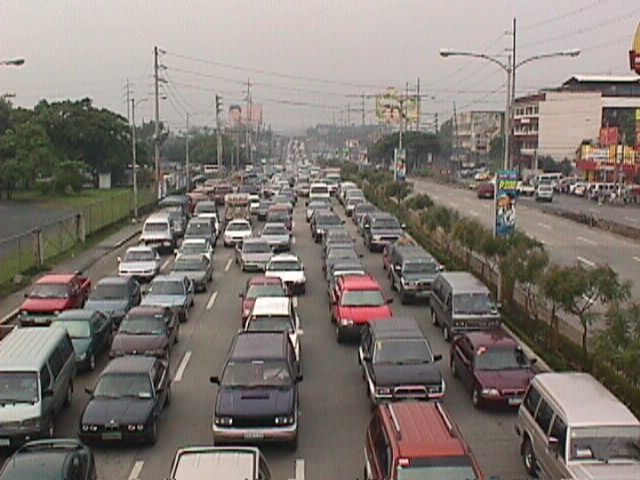 Traffic was more manageable along Katipunan then and a fleet of blue school buses served the Ateneans. It was a case of high occupancy transport that sadly has digressed to high vehicular volume, low occupancy traffic that Ateneo and Miriam are associated with today. Tricycles then were confined to the west service road and crossed Katipunan only at the intersections, which were strategically located just across from the main gates of Ateneo and Miriam. These intersections used to be signalized but the settings were often manipulated to favor Ateneo and Miriam traffic during the peak periods, much to the frustration of through traffic. 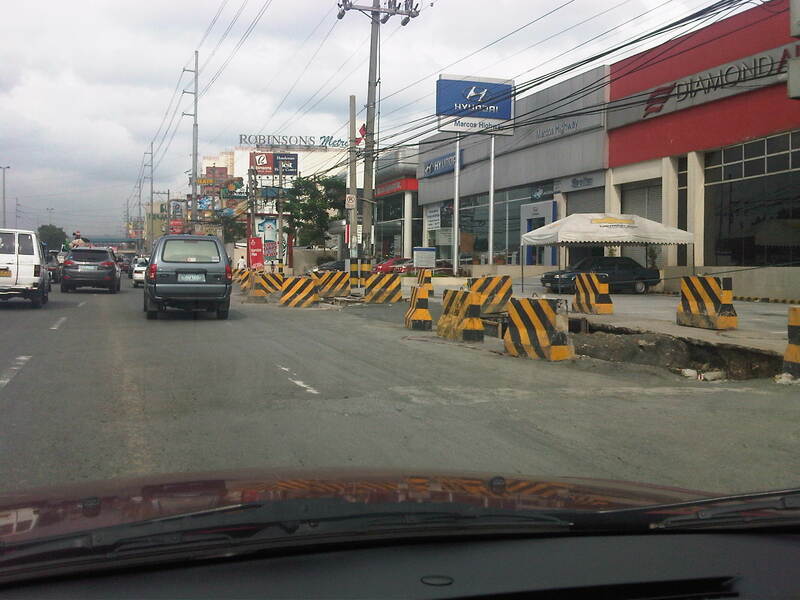 Fast forward to the present when the service road was removed along with the island to given way to what the previous MMDA dispensation referred to as a clearway policy to encourage faster traffic speeds combined with the much maligned U-turn scheme as applied to Katipunan. The smaller shops and restaurants have been replaced by condominiums and other establishments that have generated much traffic (not that Ateneo and Miriam have not been responsible for congestion) and which obviously do not have enough parking resulting in cars parked all over along the avenue and effectively reducing road capacity. An article written by Randy David through his regular column at the Philippine Daily Inquirer came out today to speak about the Professor’s personal experience about Katipunan and his granddaughter’s views on development. Entitled “Katipunan Blues,” it presents a very honest and a very common observation of what Katipunan has become through the years and what different generations think about the development (or degeneration) along the particular stretch of the avenue. Its conclusion is something to ponder about and applicable not only for Quezon City and the rest of Metro Manila but for other cities across the country as well. 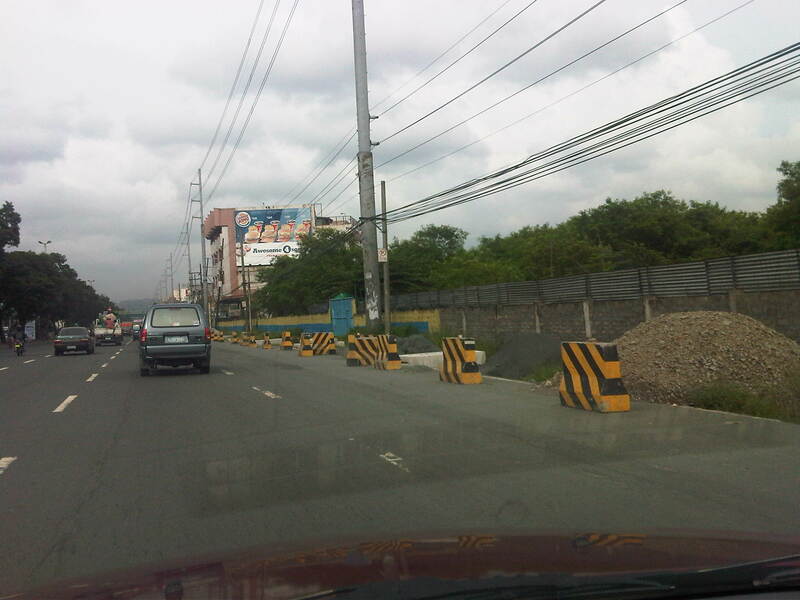 Is it too late for Katipunan given all the developments that have been permitted along this road? Did the universities do their part to prevent this in the first place? Or were they part of what Katipunan is today? Does Quezon City (or other local governments for that matter) even know what land use planning is about and what its policies on accommodating development have brought about in many other place? Could the DENR through its EIA process or the HLURB through its own instruments have prevented the deterioration of communities? There seems to be too many questions and we’re running out of answers for these. Perhaps the answers were there but authorities and officials responsible refused to take heed of these or turned a blind eye to the issues. Perhaps the various developments and SM Blue were allowed because local governments became too eager for developments that also have been equated with revenues for the cities. Still, established systems and processes like the DENR-EMB’s and the HLURB’s are supposed to be there to ensure responsible and appropriate development. We are often dumbfounded at what has actually happened and the outcomes clearly show our failures. Perhaps we are too blinded with the notion of development that we forget that it is also our responsibility to guide proponents. A lot of soul-searching should be undertaken to rethink how we plan and develop our cities. Such should properly incorporate principles of sustainability including those that address issues pertaining to transport and land use. We have a long way to go towards sustainable development as applied to city planning and development. But we need to start now if we are to even achieve a fraction of what we’d like our cities, our communities to become. We also need for champions to come forward among our current leaders and officials if only to bring order to what is perceived as chaotic development. Immediately following the delivery of the issue paper in the DPWH-BL Fair last August 1 was an open forum where the audience had a chance to pose questions and comments on what was presented. Our technical staff shared these and following each question/comment is a response. 1. Are you eyeing for an agency or organization to champion the promotion of creating a national master plan? (Response) The creation and/or integration of a National Transport Master Plan should be an initiative of the DOTC with the DPWH providing firm support (DPWH can co-chair or co-lead an inter-agency group.) This master plan is part of the mandate of DOTC. While highway planning, construction and maintenance is under DPWH, it should still refer to the DOTC which covers a larger scope in terms of transport planning. Most plans are usually submitted by these agencies to the NEDA for integration with plans from other agencies. Among the outputs of NEDA’s work is the Philippines’ Medium Term Development Plan, which is a 6-year plan designed for the term of the President. 2. Ano ang magagawa ng Bantay Lansangan para makaiwas sa “U-TURN” sa susunod na term? 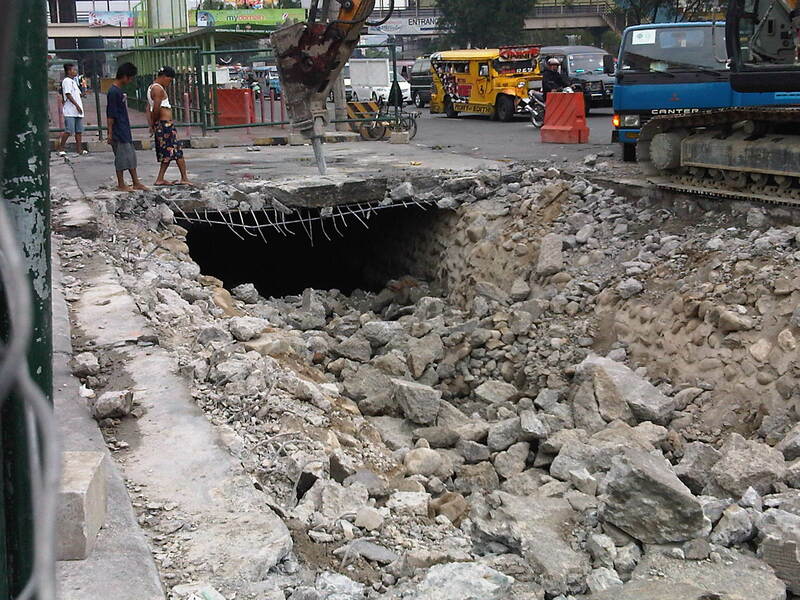 (R) The DPWH has to make a firm stand on these matters especially where design standards are concerned. While the MMDA is in-charge of traffic management in Metro Manila, they should still comply with standards for signs, markings and geometry, which happen to be under the DPWH. 3. No one was able to point out who will spearhead the creation of a national master plan, down to the details of budgeting etc.. With respect to Bantay Lansangan, who do you think is really capable of lobbying the creation of a transport master plan? (R) DOTC should have the capacity for master planning for the entire country including integration of all existing plans to come up with a clear “road map” for transportation infrastructure. The DOTC should be supported by agencies such as the DPWH, NEDA, DENR, DOE, DOF, etc. in coming up with this. There is no need to start from scratch since there are many studies and documents that could serve as references. Progressive and responsible NGOs, civil society and the private sector should be able to lobby for a national master plan that will be clear in identifying priority infra and services. 4. [REACTION] A national road plan is based on HDM 4, which is actually under the premise of asset preservation. (R) HDM-4 is mainly for pavement management and is a tool for planning for the maintenance (i.e., preservation) of roads/highways. It is not a tool that will allow for the determination of what new highways or expressways need to be built and where. For this purpose capacity is required to be able to to travel demand forecasting including the use of tools that are more appropriate for this purpose such as CUBE, VISSUM and STRADA. 5. [REACTION] I think we should not concentrate on the creation of a national master plan alone but on which project budget has to be prioritized. (R) It is not suggested that we stop working on programs and projects and concentrate on coming up with a master plan. In fact, work on a transport infrastructure master plan may be undertaken in parallel with other endeavors. One reason why we stray from the straight path (daang matuwid) is because we don’t have a firm grip on the bigger picture that is supposed to guide us in prioritizing projects. True that we shouldn’t concentrate on the creation of a master plan but it is also true is that we should prioritize based on what the “roadmap” requires and not which project seems attractive at present. This is why basic infra like certain bridges and roads are not built because funds are diverted elsewhere. I would like to believe that the private sector is looking for a reference as they formulate project proposals. Without a reference, they will continue to come up with projects that are attractive to them but may not necessarily fit the whole scheme of things in terms of prioritization. As such, the government is usually at a loss on how to situate projects within a supposed framework when one, the framework may be outdated or two, there is no framework at all. Consequently, government technical staff are reduced to evaluating project proposals without the benefit of checking whether it is appropriate. The ideal situation is that the government should be able to guide the private sector and donor agencies for where investments should be placed. Ultimately, it is government’s responsibility to the people to build the required infrastructure while minimizing the wastage of resources. Is there a need for a transport infra master plan? The NCTS crafted an issue paper for Bantay Lansangan entitled “Is there a need for a transport master plan?” partly as an exploratory initiative to widen the perspective of the organization from its current focus on roads. Master plans are supposed to be guides for both government and other interested parties such as the private sector for determining what projects are to be prioritized. They also should be able to provide the basic cost estimates and other requirements that should pave the way for more detailed planning and design for specific or particular projects. As such, the absence of master plans or perhaps outdated ones is considered as handicaps in the prioritization and implementation of projects. However, despite the availability of master plans, there is the question of the acceptance of their recommendations. There are also questions pertaining to how comprehensive these plans are and how would be able to address social, economic, environmental and even political issues should certain projects be implemented and the plan realized. On the last concern on the political aspect there are also those projects that are altered, apparently according to the whims of national or local leaders. Such deviations can be unnecessary and may lead to increased costs for project implementation. As it there have been many master planning studies conducted for the Philippines, the main issue tackled by the paper is the lack of an integrative document, a master plan for all master plans so to speak, that will clearly show how each and every major project is linked with the others. Identify recommendations and ways forward. “Master planning studies are generally directed to the government and provide frameworks for where investments should go. These include recommendations concerning prioritization that is reflected in the implementation periods or targets mentioned in the plan. Projects where the private sector may invest in should seldom deviate from those included and proposed in a master plan. This ideal situation would presume that unsolicited proposals are generally classified among non-priorities. Otherwise, it would seem that the master plan is flawed and failed to identify projects that are attractive for investments. More often than not, private sector entities will also have their own views on which projects will be most profitable and therefore most attractive for them to venture into. It is the government’s responsibility to ensure that plans are implemented according to their importance or urgency. The paper was presented last August 1, 2011 at the DPWH-BL Fair held at the DPWH headquarters at the Port Area in Manila. It was generally enthusiastically received based on the feedback I got from our technical staff who presented the paper before a predominantly DPWH audience. I will address questions and comments forwarded to me in the next posting.